CAFFÈ LETTERARIO CARRACCI FAVA, Bologna, Italy. Read&Drink. 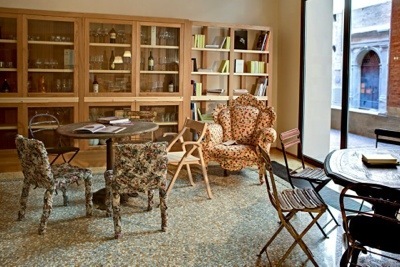 | Travel Blog & Co.
Palazzo Fava Cafè: by this literary-design-gallery café you can enjoy organic food and drinks, but also traditional pastries and coffees. In the meanwhile, enjoy its literary and art events or conversations. Before taking a rest here, don’t miss Palazzo Fava itself, with its Carracci’s frescoes, now just restored. In the heart of the Medieval Bologna. This entry was posted in Restaurants & Cafes and tagged art, articles, blog, bologna, books, cafe, caffè letterario carracci fava, community, daily post, design, food, italy, life, lifestyle, palazzo fava, postaday, reading, travel by costanzafabbri. Bookmark the permalink.